Luan Gaines interviewed author Andrea Barrett about her most recent novel, The Air We Breathe , set in a World War I-era cure facility for tubercular patients and extending the web of connected characters begun in her National Book Award-winning Ship Fever . Interviewer Luan Gaines: What was your inspiration for The Air We Breathe ? Andrea Barrett: I visited the northern Adirondacks often, when I was younger, to go hiking and climbing. At some point I noticed that all the big old houses were wrapped in porches, and to wonder what those porches had been for. When I learned that they had once held tuberculosis patients, taking the ‘cure’ in the freezing air, I became very interested in the history of that area. How common was tuberculosis in the early 20th century? Did physicians realize the disease was contagious? Were there many cure facilities such as your fictional Tamarack State in the Adirondacks? In the early 20th century, tuberculosis was quite common; as there was no effective treatment for it (other than resting), and as it was often deadly, everyone dreaded it. By the late 19th century, physicians had identified the bacillus that caused it—but they had no drug against it. Sanatoria such as Tamarack State were to be found in many states, usually in the mountain areas or in places outside cities, where the air seemed cleaner and possibly healthier. They were particularly common in places such as Colorado, California, North Carolina, upstate New York, and New England. The “cure” imposed complete rest of the body and mind. How did such restrictions as “no talking, no reading, no writing” ultimately affect the spirits of the patients? Not surprisingly, many patients grew depressed—they were separated from their families and friends, and denied most occupation. For some, though, the opportunity as their condition improved a bit to read, write, and reflect was a welcome break after years spent working very hard. The majority of the patients in The Air We Breathe are immigrants sheltered in modest housing. How does their treatment contrast with financially independent patients like Miles Fairchild? Patients like Miles cured in places of considerable comfort, somewhat like a very nice small hotel; they also had private physicians, who visited them in those places, and who looked after them carefully. For patients in the public institutions, conditions were far more austere. When Miles first conceives of his Wednesday discussion group, what is his primary objective? How does the group dynamic change over the ensuing months? He means, I think, to “improve” and “uplift” the inmates of Tamarack State; for him, this is essentially a charity project. He has no sense, at first, that the patients in the group are his equals intellectually—and hence is surprised when the patients press forward more actively, ultimately taking over the group themselves and pushing Miles’ agenda aside. Most of them are well-read, intellectually curious, caught up in the political and social movements of the time, and they’re not interested in Miles’ long disquisitions. They want to talk about what’s going on in the world around them, and are vitally interested in what they’re learning and reading. Science looms large in the novel, perhaps clarified by the nature of the cure and the pristine air the patients breathe. How does science inspire those who attend the weekly seminars? In what way does the stimulation of the mind encourage these prisoners of fate? While their bodies are stuck on the porches their minds are not—reading, thinking, talking about science (as well as about music and poems and novels and more) is the one way they can be free. Miles is a pivotal character, powerful in a way that others are not, even though he is just as ill. In what manner does Miles become a catalyst as the plot unfolds? Does he earn his power or take it? Impoverished and without expectations, Leo Marburg never asserts himself as a leader, but is of intense interest to the other patients. Which qualities do they admire about him and which to they resent? Perhaps paradoxically, it is Leo’s deeply private and solitary nature, as well as his intense absorption in the scientific passions of his youth, that draws the other, more social patients to him. They’re more used to new patients striving, as they enter the sanatorium, to integrate themselves swiftly into the community and to make friends with everyone already there. A person who holds himself apart, as Leo does, becomes the object of intense curiosity and fascination. As well as, in some cases, suspicion and hostility. Although the patients live in a rarified world, World War I gradually encroaches on their sheltered existence. Why does curiosity and concern turn to suspicion and guilt? What is Miles’ role in this dramatic evolution? Miles acts as catalyst for the patients’ volatile emotions; but what happens to Leo inside the sanatorium couldn’t have happened if the other patients hadn’t participated, or at the very least failed to stand up to Miles. The patients act, naturally enough, out of fear, and dread, and a concern for their own safety; their situation in the sanatorium—which is to say, their very lives—depends on the approval of the doctors there, the Boards of Health that sent them there, the society that funds their institution. As they feel people turning against them, beginning to suspect their loyalty (most are not native-born Americans), they respond by trying not to see what is happening around them. An analogy might be the way many people in different countries failed to pay attention to the situation of the Jews in the early years of WWII. Class differences, the constricted opportunities for immigrants, the chaos of cities in flux and the specter of war are integral to The Air We Breathe . But none of these conditions exists in a vacuum. How does human nature impact events and to what degree is isolation a factor? Isolation changes everything, doesn’t it? We lose perspective, without others to talk to. Paranoia rises, misunderstandings increase. How would you define the specific roles of your female protagonists: Naomi Martin, Irene Piasecki, Eudora MacEachern? How are their opportunities restricted because they are women? Women were active in science during those years—but always against resistance, always with difficulty. Irene and Eudora, who are of different generations, find different ways to cope with this. Naomi, who’s not interested in science, still feels her life confined by her mother’s demands and her economic situation. Naomi slips under everyone’s radar, her passion only shared incrementally with a selected few, particularly Eudora and Irene. Yet her obsession with a man who is not interested and her naiveté bring about catastrophe for Tamarack State. In what ways are Naomi and Miles similar? They share one quite destructive characteristic: both are deeply self-involved and have little sense of the needs and desires of those around them. Leo is an entirely sympathetic character, loyal, kind, curious and enamored of knowledge for its own sake. Why is Leo a more likely complement to Eudora’s personality than the more tempestuous and fragile Naomi? Leo doesn’t have much patience with temperamental people, whether women or men. He responds strongly to Eudora’s sturdiness, her intellectual curiosity, and interest in other people. Given the circumstances, could Leo have handled things any differently, both in his personal relationships and the secret he kept from the group? Yes, of course—but then he wouldn’t be Leo! Dr. Petrie is ultimately heroic, albeit obscurely. How does Dr. Petrie’s confrontation with Miles expose the venality of Miles’ motivations? Left unchecked, how much more damage might Miles inflict on the community? Miles, it seems to me, might do almost anything to that community, out of his sure sense that he is ‘saving’ it; I think that, without Dr. Petrie’s intervention, Miles might have damaged a number of the patients. Irene Piasecka is also a noble character, in spite of all she has suffered while pursuing her craft. Before Irene, many have underestimated the nature of radiation. Can you briefly explain the history of radiation and its use as a diagnostic tool? Irene learned to use X-rays almost immediately after they were discovered; and she, along with a handful of other people across the country, was one of those who refined imaging techniques for medical purposes. What happened to her as a result was common in those years; everyone viewed X-rays as a benign, even curative phenomenon, and no one suspected the long-term damage they caused. Some did notice that their hands grew red, or even blistered, but they assumed this was a transient burn—no more serious, say, than a sunburn. It was almost a decade after Irene’s first experiments before practitioners took shielding and long-term dosage accumulations seriously. In The Air We Breathe , I was impressed with the contrast between the sickness of the body and the sickness of the soul. How does one contribute to the other and what toll does it take on these already burdened patients? They speak to each other, body and soul: of course. When the patients are frightened by what is going on around and among them, when they are pressured beyond the pressures simply of being sick, they grow sicker still. I’m working on a couple of long stories. Too early to say much about either—but one is about Eudora, after the end of this novel, once she is over in Europe. Do you have any advice for would-be authors? Work every day, or as close to every day as is possible. And stick with it. A lot of getting better at this is simply patience and hard work. Andrea Barrett has received a National Book Award and a MacArthur grant and has been a finalist for the Pulitzer Prize. A fellow at the New York Public Library Center for Scholars and Writers, Barrett lives in North Adams, Massachusetts, and teaches at Williams College. Luan Gaines is a freelance writer and contributing reviewer to curledup.com. 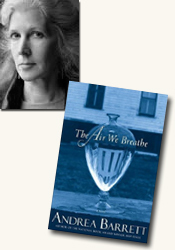 Her interview with Andrea Barrett was written in conjunction with her review of The Air We Breathe . © Luan Gaines/2007.